Why Do We Let Cops Carry Guns? The town of Northampton, MA has always been a center of racial, gender and cultural diversity; hence, it’s no surprise that the town is, apolitically speaking, about as liberal as you can get. Their liberalism was on display this week when the City Council criticized an offer from the local Wal Mart which wanted to donate $13,000 in ammunition that could be used for training the town police. This led to a nasty exchange at a City Council meeting, which made Wal Mart’s withdraw from the deal. The entire episode got me thinking about gun violence and the degree to which the discussion never seems to focus on whether the cops should actually be walking around with guns. In fact, the United States is the only advanced nation-state which grants its local police the same free access to small arms that we grant to every adult who hasn’t committed some kind of serious crime. In effect, we extend to our police the same Constitutional protection for carrying guns that we give to everyone else, even though there’s nothing in the 2nd Amendment about using a gun to enforce the law. Several years ago, our friend Frank Zimring published a really good book, When Police Kill, which pointed out that not only is the annual body count from police shootings at least double what we get from the official reports, but there doesn’t appear to be any connection between the number of police shootings and controlling crime or crime rates at all. What Zimring suggests, and the evidence certainly sustains his argument in this respect, is that other countries which have a similar rate of violent crime exercise tight control over when and how local police can carry guns. It’s all fine and well that Wal Mart wanted to give the Northampton Police Department free ammunition that could be used for training the cops how to use their guns, but many, if not most cops rarely, if ever practice using their guns. Research on this issue is spotty at best, but even a pro-cop, pro-gun blog like Bearing Arms had to admit that, “the overwhelming majority of police officers are not competent shooters.” And take it from me, that’s an understatement if there ever was one. I don’t think it would be such a bad idea if Gun-control Nation would begin asking themselves why are the cops exempted from concerns we all share about the risks of walking around with guns? To be sure, the gun-control contingent has no problem aligning itself with the various public-interest and community groups who decry police violence practiced against members of the ‘less-than-fortunate’ class. But the usual strategy here is to demand more sensitivity training and more time spent on the proper use of lethal force. How about considering the idea that cops simply shouldn’t be walking around with guns? This is exactly the point made by Attorney Goldblatt at the Northampton City Council meeting, but I don’t hear it being said anywhere else. I have been arguing, largely against a brick wall, that until and unless we get rid of handguns, particularly the handguns which account for more than 80% of all gun violence, so-called ‘reasonable’ restrictions won’t do much at all. And while gun researchers continue to pretend they can preserve the 2nd Amendment by using synthetic controls regression analysis to come up with a ‘scientific’ proof of how some new gun law will reduce shootings, there’s about as much science in that nonsense as the science that Pope Urban VIII used to lock up Galileo in 1633. Want to end gun violence? It’s simple. Take away what causes the problem, and the problem is caused by guns. Gee, that was tough one. Weapons Of War On Our Streets: A Guide to the Militarization of Police. A new column from our friends at Ammo.com. Thanks primarily to the 1033 Program which allows law enforcement agencies to get their hands on Department of Defense technology and the Bush-era War on Terror, American police have received a startling amount of heavy-duty, military-grade hardware. Between 1998 and 2014, the dollar value of military hardware sent to police departments skyrocketed from $9.4 million to $796.8 million. And just as when “all you’ve got is a hammer, then everything looks like a nail”, militarized police have become more willing to use their new weapons when carrying out law enforcement tasks. For example, the number of SWAT raids in the United States grew dramatically from about 3,000 in 1980, to a whopping 50,000 SWAT raids in 2014, according to The New Jim Crow by Michelle Alexander. To say that the militarization of the police is nothing new is to ignore America’s recent history as well as the long-standing model of a peace officer. As the police have militarized and the Pentagon backs major players in Hollywood, the focus has shifted from one who keeps the peace to one who enforces the law – and that’s an important difference. The model for police, and the constables and sheriffs before them prior to the late 20th Century, was that of a peace officer. In many states, it’s not even true that police are law enforcement officers – even though it’s a term frequently used by the police and their fans in the “Blue Lives Matter,” “Thin Blue Line,” and “Back the Blue” movements. Unrelated to the War on Drugs, the 1986 FBI Miami shootout was a game-changer for law enforcement budgets. Police outnumbered suspects by a factor of four. Despite this, they were pinned down by suppressive gunfire. The incident lasted five minutes and 145 rounds were fired. The suspects were hit multiple times, but continued to fight in part because the officers’ and agents’ service revolvers did not have sufficient stopping power. In response, there was a movement to increase the firepower of service revolvers. This is when semi-automatic pistols began to replace the revolver and larger magazines became the rule. Rifles, shotguns, and heavier body armor also saw increased adoption after this shootout. President Obama gave new directives for the 1033 program that forbade police from acquiring certain weapons from the military. These include weaponized vehicles, grenade launchers and bayonets. Attorney General Jeff Sessions ended these restrictions upon assuming office in 2017. Branch Davidians: This is perhaps one of, if not the, archetypal example of a militarized police force greatly overreaching. Armed with .50 caliber rifles, M728 Combat Engineer Vehicles (which are effectively tanks) and M79 grenade launchers, the FBI and ATF engaged in a firefight with Branch Davidians inside. Controversy remains to this day with regard to who fired first and who started the fire that consumed the building, leaving 82 members of the church dead. These are the big three, but there are many smaller events also worth mentioning. During the wreckage of Hurricane Katrina, private Blackwater contractors patrolled the streets with automatic weapons. They were accused of summary execution of looters. In a low point for militarized police in 2014, a SWAT team in Cornelia, Georgia severely mutilated the face of an 18-month-old baby boy with a flash bang grenade in a fruitless search for drugs. Private sector companies collect, store and analyze data for Fusion Centers. This would be dangerous on its own, but the lack of any oversight makes it particularly troublesome. Even if a private sector has the best of intentions, malicious third-party actors could access some of your most sensitive data if it’s been datamined by a Fusion Center. A company without the best intentions can do all kinds of “government-approved” snooping into your personal affairs. Civil Liberties: Chief among the problems presented by a militarized police force are civil liberties. 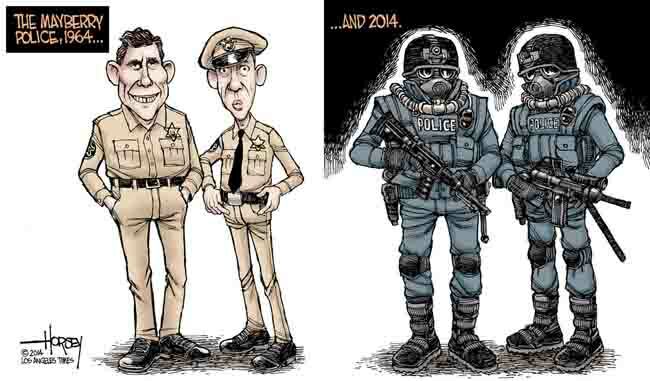 Militarized police seems to violate the spirit, if not the letter, of the Posse Comitatus Act of 1878, which forbids using the military to enforce domestic law in most cases and under ordinary circumstances. Voice of God: This one sounds impossible, but it’s not. The Voice of God is pretty much exactly what it sounds like. It’s a weapon beaming words directly into your head so that you think God is talking to you. This leverages the same technology in LRADs, but for different effect.